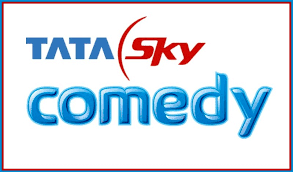 Tata Sky DTH direct to home TV service launched first comedy service on its DTH package. Tata Sky, a pioneer of innovative services in the DTH industry, has added a new service for its varied bouquet of content called Tata Sky Comedy. This would be the first interactive DTH service in India, which provides a single destination available for all Hindi comedy content formats. The service was launched today by Pallavi Puri, Commercial Director of Tata Sky and Hiren Gada, Director of Shemaroo Entertainment partner content for the service to live. The opening event provides a vision of the service of the actors in action Sugandha Mishra and Sahil Khattar, who are also part of the service. Tata Sky comedy offers a specially created original comedy videos content for the service along with the best comedy TV shows like Nukkad, Ye Jo Hai Zindagi, office office and Zabaan Sambhalke. All efforts are shaping the content available through this comedy service - parodies critical wispy funny movies, comedy movies, jokes and jokes of faking news programs. Tata Sky subscribers now have access to the comedy of content at the touch of hand. The service is full of rib-tickling content that is updated daily and plays 24X7 without advertising. Tata Sky became a partner with Comedywalas, an entertainment service of Shemaroo for exclusive content such as Bollywood Tadka and comedy Fatafat. The interactive part of the Service includes Jokes, Entertainment Quiz dialogue Baazi (based on the dialogues of Bollywood movies) and a popular comic Suppandi, which are updated daily. The service offers clean non-stop entertainment for all age groups across geographical boundaries and socio-economic. Now you should not be transferred to rely on the content of the comedy or see Stick for dates for the comedy. Pallavi Puri, Commercial Director, Tata Sky said: "With Tata Sky Comedy our goal is to provide a fun way to relax to our subscribers. Comedy is a genre that the public has a big appetite. We want this gap to be filled with this latest offer from Tata Sky. With Shemaroo in partnership, our attempt to create a single window for all comedy shows that will be available daily and 24 hours." From experience, Hiren Gada, Director, Shemaroo Entertainment said, "We are very pleased to start the service Tata Sky Comedy. As head of the aggregator and the content owners, our ongoing efforts are to serve our audience in new and innovative ways. Comedywalas is a Shemaroo initiative. Given the fact that comedy is a kind of entertainment that is so universal, our efforts will be to add to produce very nice comedy programs"